A 2014 alumnus of the Criminal Justice program at the Bohlen Technical Center is seeing his law enforcement career blossom, and he credits his time at BOCES for helping him along the way. 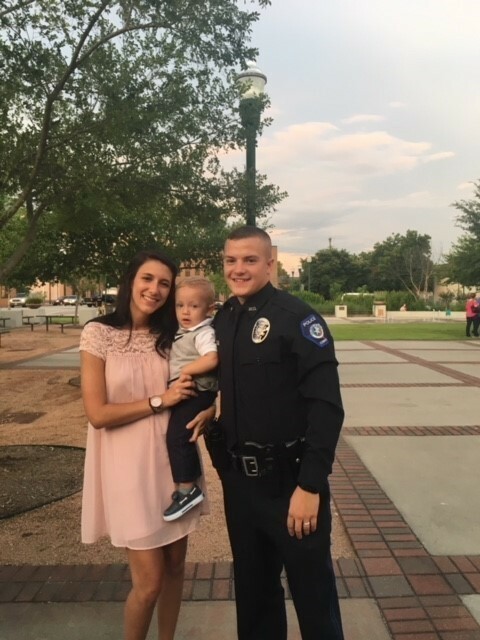 Michael Moote, a graduate of Watertown High School, currently works as an officer with the Conroe Police Department in Montgomery County, Texas, located about 40 miles north of Houston. His journey to Texas began inside a BOCES classroom where he was taught by instructors Jeffery Scofield and Patricia Cohen. Michael says his interest in the Criminal Justice program began with an eye toward joining the military, something he planned to do following his high school graduation. While he did join the National Guard, his time in BOCES did kindle an interest in law enforcement as a potential career. While at BOCES, Michael became involved in the SkillsUSA program and took part in the 2013 New York State Competition, winning a team gold medal in the Community Service category. Unfortunately, National Guard training kept him from competing in the Nationals that same year. Michael’s life after BOCES took him to the state of Texas where he was a reservist for the National Guard and served as a paralegal. He found a job at the Montgomery County Jail, which Michael calls a good starting point for a professional career, and enrolled in the local police academy in January 2017. He graduated six months later. He then became an officer with the Conroe department. Michael says having the Criminal Justice program on his resume played a big part in opening doors for him. Michael has spent time speaking with high school students in Texas, giving presentations at career fairs and relaying the benefits of a law enforcement career. To learn more about the Criminal Justice program offered at Jefferson-Lewis BOCES, click here.